Paylines on Slot Machines - What and Where Are They? 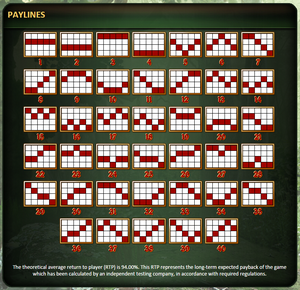 There was a time when I didn’t really think of the word ‘Paylines’ when playing slot games. Why should I when the games only had one of them. I’d simply spin the reels and hope I got a winning combination appear on the all-important payline. Nowadays, the payline is the most important part of a slot game. The total number that there is determines the number of different lines that can produce winners for you. As you can imagine, games that had just the one along the middle of the reels proved difficult to get wins on, especially large ones. 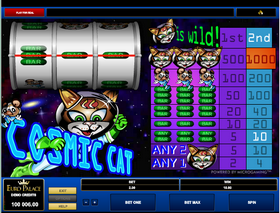 There are still some games that hark back to the past, ‘Cosmic Cat’ from Microgaming only has the one payline for you to win on. Recent years though have seen the number of paylines grow and grow. ‘7th Heaven’ from BetSoft has 18 paylines, while in the Barcrest slot ‘Arabian Charms’ there are 20. The BetSoft game ‘Rook’s Revenge’ has a total of 25, so what effect does the number of paylines have on the way you play slot machines? There are some important decisions for you to make when it comes to paylines. Some games have a fixed amount but that isn’t often the case. Let’s go back to ‘Rook’s Revenge’ which has 25 paylines. You don’t have to play them all and it’s up to the player to decide just how many they want to activate on the next spin of the reels. This is of course linked to the stake that you want to make on the next game. Each payline you choose is increasing your bet. If there’s only 10 paylines in the slot that you are playing, then activating all of them might not cost you too much. There’s also the choice of how many coins you want to bet on each line. If you’re playing at maximum stake, then the cost of playing can soon mount. If there are 10 paylines then you’ll need to be betting a minimum of 10 coins to activate all of them. ‘The Rook’s Revenge’ game allows you to play for just 1p (penny slots). That means activating one payline with a 1p stake. That won’t give you a great chance of winning though. The more paylines you activate the better, and there are many games in which you have to be betting at the maximum bet if you want to stand a chance of winning the progressive jackpot. Paylines aren’t the only way of getting good wins of course. Scatter symbols don’t have to be on the same payline to get you a win and can also trigger the lucrative bonus games that slot games have. Where are all the Paylines? Gone are the days when paylines were only in straight lines. Now games feature paylines that are straight, diagonal and shapes you’d probably only see on an episode of ‘Hole in the Wall’. Working out just where all the paylines are isn’t an easy job. It’s important to have a look at the paytable as this shows you where all the paylines are. Some games do actually show you where each one is as you activate them. Take Bally’s ‘Lady Robin Hood’ which has a huge 40 different paylines. When there are a lot of paylines then the chances of you getting a win are better. They may be ones offering small returns but any win should be appreciated, especially if you’re staking a lot of money to activate those paylines. You will only get wins on paylines that you have activated. It’s the ultimate case of ‘you have to be in it to win it’. Imagine the horror if you see a winning combination but the machine doesn’t pay out anything simply because it’s on a payline you haven’t activated. The machines mainly pay out on wins from left to right. There are some that pay in both directions though. Gambling low and activating all the paylines can be a good idea. Let the wins accumulate and then slowly increase your stake.